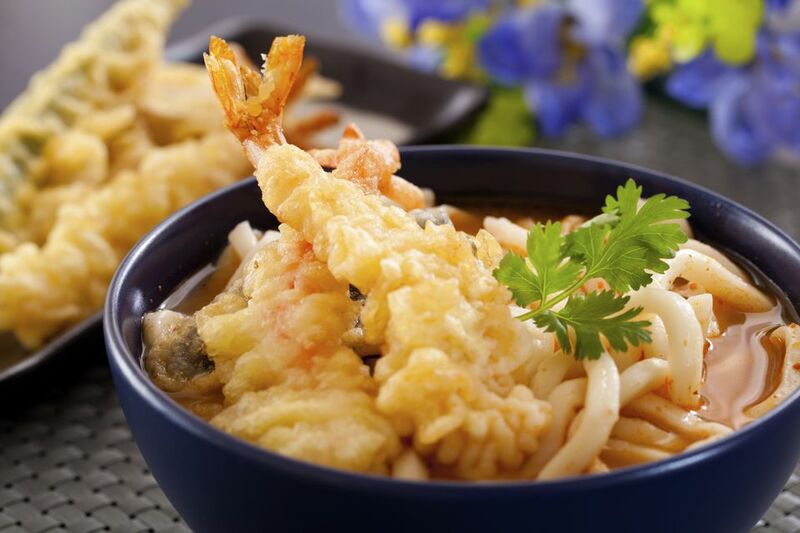 Tempura udon is a classic Japanese dish of thick wheat noodles (udon) in a savory hot broth garnished with crisp pieces of tempura vegetables and shrimp. The udon soup broth can very easily be made from scratch using three simple ingredients which should be staple items for any Japanese-cooking kitchen: dashi broth, soy sauce, and mirin. Note, the dashi broth can either be homemade or quickly prepared using powder bonito fish (katsuo) dashi. Depending on the region of Japan, the broth for udon noodle soup varies from dark brown to light brown with varying degrees of saltiness. For this reason, the recipe below can be adjusted by changing the amount of soy sauce that is used. If you are used to a lighter flavor, I recommend starting with two tablespoons of soy sauce, working up to the recommended four tablespoons (or 1/4 cup). If you’re in a hurry, don’t be ashamed to use a pre-made powder, clearly labeled as "udon soup", which is readily available boxed, at all Japanese grocery stores, and some Asian supermarkets. It can also be purchased online. Use pre-made tempura that can be purchased in the deli section of most Japanese grocery stores, or from your favorite take-out Japanese restaurant. Another alternative is to simply use pre-made frozen shrimp tempura that can quickly be fried prior to serving. As a short-cut, use leftover tempura or pre-made tempura from a Japanese deli or supermarket. To crisp leftover or pre-made tempura, simply reheat in a dry non-stick pan (do not coat the pan with any oil) over medium-high heat, turning over frequently until crisp. In a medium pot, bring water to boil and cook frozen udon noodles for 1 to 2 minutes until tender. Drain the noodles well. Separate noodles into two portions and serve in large Japanese-style soup bowls. Next, make the udon soup. In a separate medium pot, combine water and dried dashi powder mixture (or use homemade dashi using the recipe available here) over medium-high heat. Next, add soy sauce and mirin and bring to a boil. Taste the udon soup. Optionally, a teaspoon of sugar may be added but is not necessary. Adjust the taste of the broth if necessary, by adding more soy sauce if desired. Turn off heat. Ladle hot broth over the udon noodles, top with crisp tempura. Garnish with green scallions and fish cake. Add Japanese 7-chili spice (shichimi togarashi).